A promotional video released by Dolce & Gabbana three days before their November 21 Shanghai show turned into a PR nightmare for the Italian fashion house. 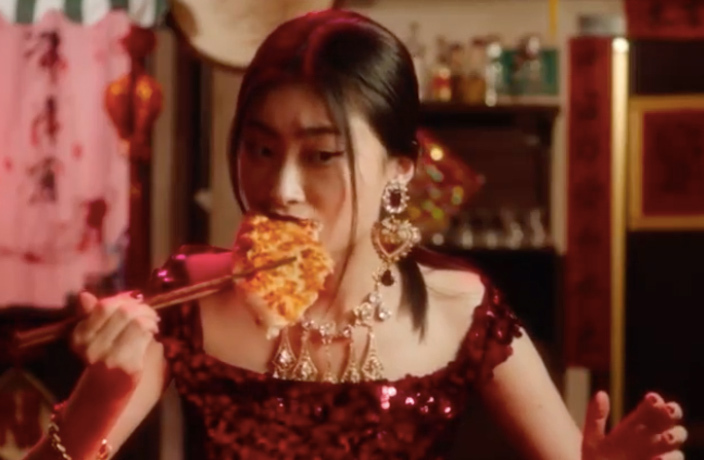 In a three-part video series titled ‘Eat with Your Chopsticks,’ a Chinese woman in a red sequin dress and jewelry is seen struggling to eat pizza, pasta and cannoli with the traditional eating utensils, but eventually figures out her own way to enjoy these classic Italian dishes with them. Many viewers saw it as an offensive portrayal of the Chinese people, and the videos were promptly deleted from the brand’s Chinese social media accounts after some serious backlash and calls for boycott, though they’re still available via the brand’s official Instagram and Facebook (as of 4.53pm on November 21, anyway). The drama didn’t just end there, however. Days after the original ad was released, IG user @michaelatranova posted screenshots of an alleged argument with D&G cofounder Stefano Gabbana via direct message, where the 56-year-old designer was seen calling China “the country of (turd emoji)” and its people “ignorant dirty smelling mafia,” and that the videos were only removed because their Chinese office decided to do so. But the apology was too little, too late for them. Many Chinese celebrity attendees of the November 21 Shanghai event, including Chen Kun, Li Bingbing and Huang Xiaoming, all decided to cancel their appearances following the debacle. Shortly after her cancellation announcement was made, Li’s Weibo post of “I love my country” saw more than 50,000 likes and 4,000 comments in two hours. Shortly after, it was announced that the entire show had been officially canceled. This isn’t the first time Dolce & Gabbana has gotten themselves in trouble with Chinese people. Last April, the brand caused controversy for portraying Beijing as an impoverished city in their “DG loves China” campaign. Back in 2012, it also caused an uproar when they stopped people from taking photos in front of their Hong Kong flagship store in Tsim Sha Tsui. The three-point specialist has reached a two-year deal with the Phoenix Suns. The British singer will no longer be bringing her highly anticipated Phoenix World Tour to Shanghai on March 12.